These days, the mention of 3D-printed weapons conjures up visions of people printing AK-47s in their garages (ok, that might just be me). But a recent story in the Armed Forces Journal brings word of a more systematic implementation of 3D-printed warfare. 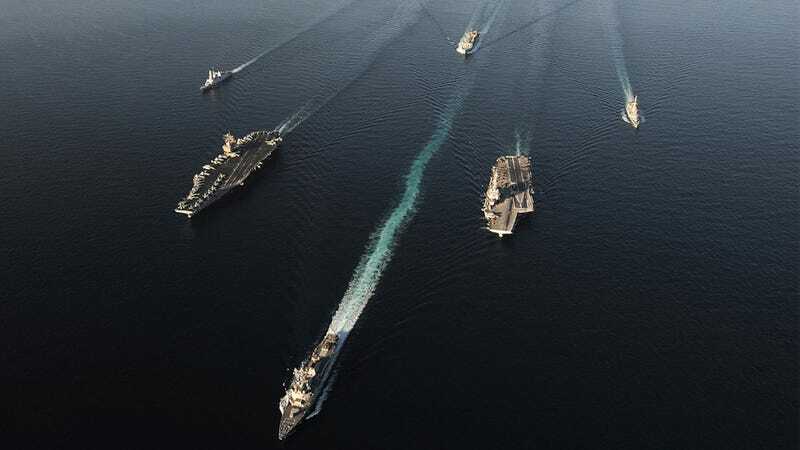 According to one Lieutenant Commander Michael Llenza, the Navy's future lies in converting aircraft carriers into “floating factories,” each carrying a fleet of 3D printers to churn out weapons, drones, and even shelters at a moment’s notice. There’s money and time to be saved in the sheer logistical rationality of the scheme. For example, when cylindrical bullets are stacked, tiny bits of wasted space are created—which add up, when you're talking about millions of the things. Rectangular packages of powder, which could be printed into bullets when needed, are a far more efficient use of space. […] The University of Virginia printed a UAV controlled by a relatively cheap Android phone whose camera was used to shoot aerial imagery. Designed for a top speed of 45 mph, the aircraft crashed on its first flight. The students just went back to the lab and printed out a replacement nose cone, a capability envied by any squadron maintenance officer. The eventual goal is a drone that flies right out of the printer with electronics and motive power already in place. An organic ability to print replaceable drones from ships, forward operating bases or during disaster relief operations to serve as targets or observation platforms could be a huge enabler for sailors and Marines. A rendering of the Contour Crafting system, the University of Southern California program that's developed a technology to print at an architectural scale.